“This is my country!” California driver launches a racist tirade against a U.S. veteran. James Ahn, a Fremont resident from Seoul, Korea, said the encounter shocked him. “My head went blank,” he told this news organization Thursday. Go back to your f-ing country. This is my country. This is not Chinese. Oh my god, Chinese ugly – ugly Chinese. I was driving in Fremont last week and this lady started the racial harassment while threatening me on the road only because I wasn’t driving fast enough for her. Clarification: I was driving at the posted speed limit of 35mph but she wanted me to move out of her way cause she was speeding. As I changed the lane, she kept driving towards my car gesturing to crush me and cutting in front of me to slam on the break. I later realized that this was more like a hate crime than a road rage. There was no other incident before my friend started filming her to save the road rage footage of her in case she ended up crushing my car. We did not say anything to her other than looking at her wondering why she was misbehaving as shown on the video. I have her license plate number and planning to file a hate crime charge against her. Please share so you can stay way from this racist in case you see her on the road. FYI racist lady, this is my country since I am a citizen plus veteran currently serving this country. Do not disrespect anyone by their race! The Fremont Police Department confirmed the incident on their Twitter account, but concluded that there was no crime committed. “Many have become aware of a disturbing incident that occurred in Fremont. We investigated, took statements from both parties, but could not establish a crime. Sadly hate speech in and of itself is not a crime. This incident is not reflective of our diverse & compassionate City,” they tweeted. Many have become aware of a disturbing incident that occurred in Fremont. We investigated, took statements from both parties, but could not establish a crime. Sadly hate speech in and of itself is not a crime. “I proudly represent #Fremont in Congress. 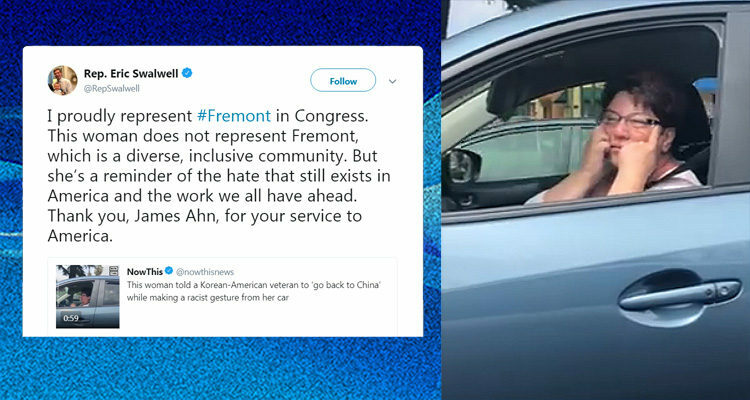 This woman does not represent Fremont, which is a diverse, inclusive community. But she’s a reminder of the hate that still exists in America and the work we all have ahead. Thank you, James Ahn, for your service to America.” he tweeted. Fremont Mayor Lily Mei wrote that she was “deeply disturbed” by the incident. “Yesterday I was deeply disturbed to learn of an ugly road rage incident. Most disappointing is how the ignorance of one individual can reflect negatively on our compassionate welcoming community. Fremont embraces our diversity that makes us prosper because ALL are welcomed,” she tweeted. Yesterday I was deeply disturbed to learn of an ugly road rage incident. Most disappointing is how the ignorance of one individual can reflect negatively on our compassionate welcoming community. Fremont embraces our diversity that makes us prosper because ALL are welcomed.